Review: Tommy Vitaly – Forever Lost – IceWarrior Records – Release: April 15th, 2016. Tommy Vitaly is an Italian guitar player from Florence, Tuscany! He already released two solo albums in 2010 (“Just Me”) and 2012 (“Hanging Rock”). I was very impressed with his last neoclassical metal inspired album and was curious to what I would be hearing on this EP. His third full album “Indivisible” will be released later on this year. But in the meantime he released this EP with some new and reworked stuff. The title track is an acoustic version of a track from Tommy’s previous album. This romantic version with Henrik Brockman on vocals is a solid ball of emotions! But the real treat here are the three instrumental tracks, if you ask me! Starting with ‘Vertigo Suite’ where the neoclassical shredder awakens in Tommy and we get submerged in a bath of arpeggio’s, melodic pieces and even some keys and piano. A real piece of art this track! ‘Impromptu’ follows that path, but leaves far more space for the piano. Therefore it becomes my favorite. ‘Jingle Hell Bells’ is a worthy neoclassical adaption from the classical Christmas tune. Speed is the main word here! We also get a live version from a song of Tommy’s first album. ‘Ready To Die’ is highly Iron Maiden influenced. The fast ‘Fly High, Touch The Sky’ was also on the debut “Just Me”. This remix adds some keys to the sounds and sounds a bit like the happy metal from Helloween! These tracks make me very hungry for that upcoming full album! 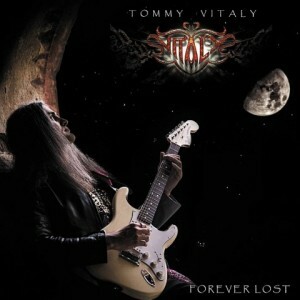 Tommy’s guitar playing is superb and fans from Malmsteen will love this stuff! He can shred like hell, but never lets his guitar take over the song. Above all he sounds melodic and that’s why I love his playing! This is a fine appetizer, but I want the main dish, Tommy! And you better hurry up, because my hunger for more is unbearable!